“Let us never forget, when they were young, these men saved the world.” Those were the solemn words of President Bill Clinton during an address to honor the men who stormed the beaches of Normandy on D-Day. As I drove past the World War II Memorial in our nation’s capital on a sunny Memorial Day morning, I paused for a moment to remember those soldiers who made the ultimate sacrifice so that we could live in a country where we are free to chase our dreams. After my round at Diamond Creek in the mountains of western North Carolina, I had driven to Washington, D.C. and bedded down for a good night’s sleep. With two weeks remaining before the end of my one-year quest to play all 100 of the Greatest Courses in America, I had just 10 courses remaining with tee times for all but two. Under clear skies I drove to Aronimink Golf Club where Jeff Kiddie, had agreed to accommodate my round at this course in the bedroom community of Newtown Square, Pennsylvania where he is the Head Pro. My expected host for Pine Valley had also promised to get me onto Aronimink, but challenges and conflicts prevented him from following through on either. I’d learned over the last year that sometimes even the best of intentions doesn’t always lead to direct success. While my expected host couldn’t get me onto Aronimink and Pine Valley, he did get me onto another course that led to introductions that helped with several other courses and I remained hopeful that something would work out for Pine Valley. The club was bristling with activities. As I walked past the members enjoying a day of food and relaxation, I wondered if on this day it would occur to them that we and our kids are free to celebrate because brave soldiers were in distant lands keeping us safe. I entered the clubhouse and did my normal chatting it up with the pro staff before heading to the practice range to meet my caddie, Justen, a young redheaded lad who was home from college. I chose to play from the blue tees at 6521 yards with a rating of 72.2 and a slope of 130. The opening hole on this championship course which was set to host the BMW leg in the 2018 Tour Championship series for the coveted FedEx Cup is a 419-yard par four. Perched atop the very elevated fairway, Justen and I could see all the way past the clusters of fairway bunkers off the right side at about 100 yards short of the green, to the pin tucked behind the bunker off the right front of the green. We could also see the three layers of increasing higher rough aligning the fairway. 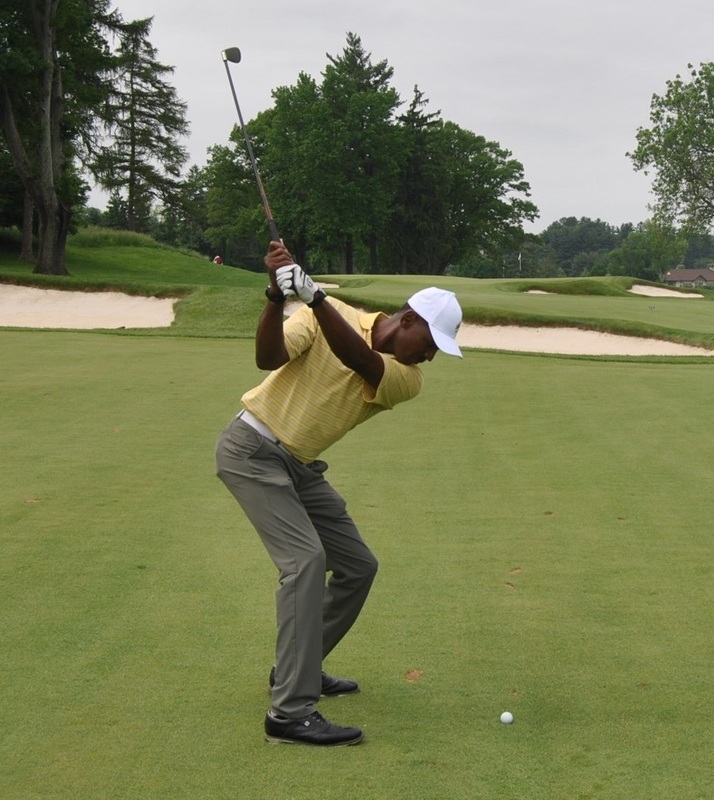 I stroke the ball solidly sending it down the left side of the fairway. It drew slightly before landing and rolling just into the edge of the first cut of rough leaving an uphill shot that was playing about 205 yards to the pin tucked behind the right front bunker. I hit slightly behind the ball, but it held its line while coming up short of the bunker. With the pin tucked behind the bunker I decided to play it safe and pitch on a line just right of the bunker. The ball landed pin high, leaving a 25-footer for par. I hit my putt on line but the ball moved left instead of right as Justen and I had expected. I tapped in for an easy bogey to open my round. With six rather large bunkers staring me in the face right where the 372-yard par four second hole makes its dogleg turn to the left, I lined up to hit my drive down the right side of the fairway. The ball started much farther right that I had planned. It hit hard in the right rough before kicking farther right and into the fescue. The best I could do was muscle it out to 85 yards short of the pin. The pin was positioned in the middle of a green with a wide-open front taking the bunkers guarding each side out of play. I hit a high lob wedge directly at the flag. The ball dropped straight down and came to a dead stop on the front edge of the green. My par putt missed the hole by four feet to the left. I made a firm stroke and watched as the ball dropped into the bottom of the cup for my second bogey in a row. 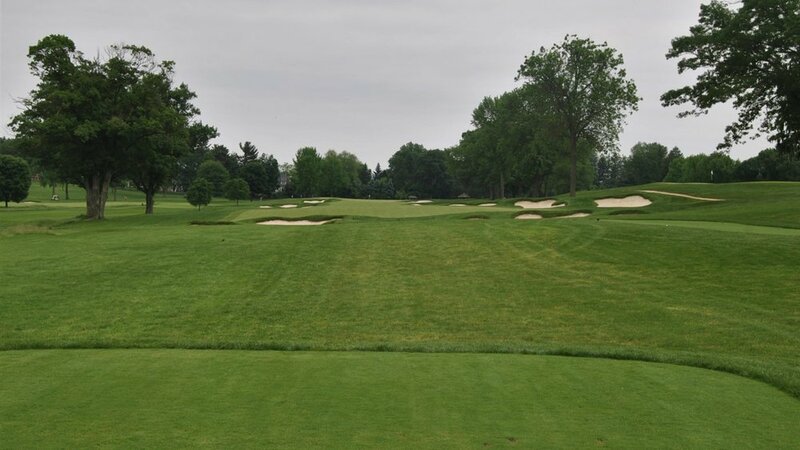 The up and down terrain of Donald Ross’s design goes deftly flat on the 403-yard par four third hole. I concentrated on making a full turn with my driver. The recoil sent the ball soaring down the middle of the fairway well past the bunker on the right at just 160 yards from the tee and the much farther left bunker which ends at 240 yards off the tee. I was left with 150 yards and way too many bunkers for me to count to a middle pin. A high flying shot with my eight iron left me 18 feet below the hole and slightly to the right of it. Justen and I circled the green a couple of times as we intensely studied the hole. We settled on a line. I struck the ball and we watched as it rolled slowly toward the cup, falling in with its final revolution. Birdie. The scale on the 419-yard fourth hole looked out of proportion as I watched Justen walk up the right side of the wide tree lined fairway. The visible bunkers seemed way too close to the tee box to be of concern. A drive beyond 200 yards would easily clear the three off to the right and the three off to the left. My drive faded a bit too much before rolling into and settling down for a nap in the first cut of rough off the right edge of the fairway. My club came across the top of the ball and sent it flying left toward the bunker about 80 yards away. While Justen and I saw the exact line of flight, we had trouble locating the ball. We discovered it hidden the thickest part of the rough on the edge of the front of the bunker. I planted my right foot firmly into the sand. With my second foot resting high on the slippery grass on the edge of the bunker, I made the only stroke I could – a shot pitch which sent the ball a measly 30 yards. Another high sailing approach shot to a back-left pin, landed on the front edge of the green. My putt came to rest about two cups to the left of the hole. Justen picked the ball up and tossed it to me as I wrote down a double bogey, a classic PBFU. For those that don’t understand that acronym, it describes a post birdie screw up using a much more colorful word than exists in my vocabulary. The saddle back green guarded by four bunkers around its front was an unexpected welcomed sight. Playing just 143 yards and rated as one of the easiest holes on the course, it provided an opportunity to recover from my first double bogey of the round. It also seemed like the right time to achieve a goal that had continued to elude me on my quest. The coveted hole-in-one. I’ve had two during my fourteen years of golf, but none on the over 350 par threes played so far during my quest. My great hopes for the hole vanished as I watched my tee shot hit on the left edge of the green and kick into the bunker. Pin high but short sided, I looked up too soon during my swing and sent the ball streaking across the green to the other side, leaving a long par putt that I failed to get to the cup with one putt. I dropped the second putt to save bogey. I aimed my tee shot on the 375-yard sixth hole down the left side expecting to fade the ball around the bunkers off the right side of the fairway as it doglegs to the right. Needing 225 yards to bend around those bunkers, my drive came up short. The ball landed in the rough just before the bunkers. In addition to contending with a ball sitting down in the rough, there were two trees partially obscuring my line to the pin. The uphill slope added ten more yards to the distance. I rose to the moment to make the type of golf shot that we golfers carry with us to the end of our days. I made the exact swing that I’d imagined and stood in awe as the ball flew out of the rough, sailed toward the left edge of the green, and then faded toward the flag. It landed past the hole, ran up the slope at the back of the green, and then rolled back down toward the hole, stopping 15 feet to the right of it. Justen handed the putter to me and I made the walk from the thick grass to the short grass and then the even shorter grass. We studied the line and settled on a cup and a half break from the back of the green toward the front of the green. I made a solid stroke to send the ball on its way. It stopped even with the hole without ever dropping down toward it. I tapped in for my par. The gradual rise from the tee box to the fairway meant that even at six feet and four inches, all I could see as I looked toward the seventh hole, were the newly installed bunkers off the right side of the fairway and the tops of the trees in the distance. My drive sailed right and landed in the rough covered mounds well right of the fairway. The line to the green was block by the sprouting and leafy branches of a large tree. Justen and I discussed my options as we waited for the green to clear. I’d finally caught up to the foursome in front of us. The ball was below my feet and nestled down into the deep rough. I decided to aim well right of the tree and try to bring to ball back toward the green. I got under the ball and popped it up. It flew high and straight before landing on the downslope off the left side of the green with another tree blocking the green. I tried to run a low shot onto the green through the small opening between the bunker off its right edge and the one along its left edge. The contour of the apron leading to the green pushed the ball to the left and into the rough just above the left greenside bunker. I stood on the slope in the bunker, gripped the club on the shaft. I chipped on to four feet before sliding down the slope of the bunker. I sunk the putt to save bogey. It was the only stroke on the entire hole not hit from a tee or the rough. The green on the 204-yard par three eighth hole run almost to the tenth green. The small pond between the elevated tee box and the apron leading to it and the bunkers protecting it along the right side and left front serves to add to the beauty of the hole. The foursome ahead marked their balls, stepped aside and motioned for me to play through. Playing through is one of the toughest shots in golf. You have an audience and the pressure of hitting a good shot so that you don’t needlessly delay the group letting you play through. I tried to relax and let the club swing itself. The ball soared high on a perfect line toward the flag. It dropped from the sky well short of the hole leaving a 25-footer for a birdie. The ball was still moving with a little too much speed as it caught the inside of the cup and rimmed out. I picked up for my par and made the long walk through the trees and across the cart path to the ninth tee. It looked like I could reach out and touch the four bunkers cut into the mounds just short of the cluster of trees off the right side of the fairway. Justen said, “trust me Mr. James, they are farther than they look. You won’t be able to reach them.” He then said, “but you can reach the two left, so aim along the right edge of the ones well beyond those.” I started my drive along that line, the ball faded and landed in the right rough, leaving 270 yards to the green on the 515-yard par five hole. “Best to lay up here. Hit your pitching wedge over the bunkers just in front of us and toward those same bunkers in the distance that you used for a line off the tee.” I made the shot and Justen said, you are in the middle of the fairway and about 150 or 160 yards out. The uphill added at least 15 more yards to my approach shot. Justen and I discussed which club would be the right one for the shot. The front of the green was wide open. I thought a seven iron would be enough to reach the flag in the middle of the green. Justen suggested my six iron so that I could make a smooth swing. I went with his call. The swing was smooth, the contact was pure, and the sound was a nice click. I said to Justen, “I hit it too good.” The ball sailed over the green and came to rest a couple of feet off the back. But I couldn’t be upset at the shot. Going with the longer club allowed me to make a smooth swing. I pulled my putt right off the bat. The speed was good, so the ball stopped even with the hole but four feet to the left. I rammed the straight putt into the cup to finish the front nine with a 40 and most importantly, only one double bogey despite hitting just one fairway and three greens in regulation. As Justen and I made the turn to the tenth hole I noticed a few people starting to gather near the tents that were set up for the Memorial Day celebration. It made me even more appreciative of Jeff Kiddie allowing me to knock off my 91st course with only sixteen days remaining before my one-year deadline. The 415-yard hole plays downhill to a wide fairway with thick trees pushed off to the left and tighter but more sparse trees on the right. There are a couple of fairway bunkers along the way as the fairway starts to rise on its approach to the green. My drive sailed down the right side and hit into the rising slope. The ball rolled back down the slope, leaving a long approach shot. Justen said, “there is water off the left side of the green. A miss right is better than a miss left.” I set up for a draw down the right side of the fairway. I hit the ball a little fat. It never turned over. It dropped just off the fairway and into the thick rough about 50 yards short of the front-right pin. A little too much juice on my pitch shot sent it just beyond the back left portion of the green. I putted from off the green to two feet and tapped in to save a bogey. I counted twenty bunkers along the fairway and around the green as Justen and I stood on the tee box waiting for the group in front of us to clear. With all those bunkers, the only safe harbor was the middle of the fairway. The ball flew high and dropped straight down appearing to come to a dead stop. As Justen and I approached my ball in the middle of the fairway, 225 yards from the tee, we noticed that it was just a foot farther than the mark it made when it landed. I still had to contend with seventeen of those twenty bunkers that I counted from the tee. Ten of them were arrayed around the rather large and slightly elevated green. There were four off the front right, three off the front left and three more cut into the slope behind the green. Fortunately for me, the flag was in the dead center of the unguarded opening on the center front of the green. Justen shot the distance and said, “its 168 yards, go right at it.” The ball flew on a high arc toward the flag, falling just inches from the front of the green. I yelled from the fairway, “stay right there.” It listened. I pay a little extra for balls with ears. Justen and I thought we saw a slight right to left line for my birdie putt from off the green. My putting stroke was smooth. The ball didn’t hop off the face. It rolled toward the cup holding its line on the right edge before moving slightly farther to the right rather than to the left as it approached the hole. I tapped in for my first par on the back nine. I counted just twelve bunkers from the tee on the 433-yard par four twelfth hole. Justen walked out ahead as I waited again for the foursome ahead to clear. My 220-yard drive landed on the right edge of the fairway and rolled into the rough between the third and fourth bunkers. I got way too much grass between the clubface and the ball and popped it up to 105 yards from a back left pin. Only one of those twelve bunkers I counted from the tee was around the green, off its right side. I aimed my sand wedge toward the left pin but pulled the ball. It kicked off the slope off the left side to the green and 10 yards away. I used a Texas wedge (putter for the non golfers) and putted from off the green to 15 feet. My bogey putt slid by the hole leading to the second double bogey of the round. It took ten par fours, but I finally got a short one. The lucky thirteenth hole measured just 354 yards, but with enough bunkers to almost make it beach front property. Justen said, “a 200 to 210 yard shot to the left side of the fairway will get you past the first six bunkers, leave you short of the next four and give you a nice angle to the pin. I hit my three hybrid toward the bunkers on the left. The ball sailed over the first set of bunkers and came to rest short of the second set. I had a nice angle to the back right of center pin tucked behind the bunker off the right front of the green. I saw the one of the guys in the group ahead motion for me to hit up. They stepped to the left side of the green and watched as I hit my approach shot on a line just left of the edge of the bunker off the front right of the green. The ball came in a little low and skirted past the hole in to fringe just off the back of the green. The foursome on the green was a friendly and chatty group of members who seemed not to be bothered by an unaccompanied guest playing their course on a holiday Monday. After I thanked them for allowing me to play through. They asked my name and where I was from. I told them about my quest. That started a longer conversation about some of the other courses I’d played. One of them said, “well, nice shot in, now make the putt for birdie.” My ball was in the fringe but had come to rest against the rough. The speed on my putt was good, but the ball was never on line. It missed by a couple of feet to the right. One of the members called out, “we’ll give you that one.” Justen picked up the ball and we headed to the fourteenth tee. The tee box on the 190-yard par three fourteenth pointed me toward the bunkers well short of the left side of the green. I think they were there to divert my attention from the green side bunkers which were the real defense on the hole. The hole was playing 200 yards with the cup on the back-right corner. I got a little under the ball with my five hybrid and popped it up. It landed 70 yards short. Justen, who was learning my game by now asked, “you want the lob wedge?” I said, “exactly. I just need to take a little off it to land the ball right at 70 yards.” I made just slightly more than a three-quarters swing. The ball flew high, descended, and landed below the flag. It took one hop then rolled to three feet right of the flag leaving an easy putt for my par. The wind was back into us on the long par four fifteenth hole. The hole measures 433 yards with more bunkers than I had time to count. They were short of the fairway, left of the fairway, right of the fairway and off the front of the green. Not a one of them was in play. I smashed my drive down the middle of the fairway easily carrying the first groupings of bunkers and well short of the distant one. At 195 yards out from a flag blowing in the breeze on the middle of the green, a straight ball would take the remaining fairway bunkers and the green side bunkers out of play. I striped my three hybrid into the wind. The ball rose steadily as it flew directly toward the flag. It landed pin high to the left of the flag, curved left and rolled to 25 feet away. Justen said, “it breaks toward the front of the green. Give it two cups to the left of the hole.” I hit the ball on line but didn’t put enough pace on it. It broke below the hole. I lifted my putter and squeezed the head. It’s the one of the few things I’d seen Tiger do, that I could replicate. An easy par, but a lost birdie opportunity. Justen walked ahead as I prepared to hit my drive on the 516-yard par five sixteenth hole. I wondered if they had run out of sand by the time they got to this hole. There are only three bunkers on the first half of the 35-yard-wide fairway. All three off the left side of the fairway. I had found my swing, another drive sailed down the middle of the fairway. Justen was waiting at my ball. I handed my drive to him and he handed a five iron to me. He said, “this should you put you short of the bunkers on the right and leave you with a sand wedge to the flag.” I laid up to 110 yards, ten yards less than what I wanted. Justen asked if my sand wedge would still be enough. I said, “it will be close, but I’ll go with it.” I didn’t get all of it and it wasn’t enough. The ball landed just short of the green. My only thought as I stood on the tee on the 172-yard par three seventeenth was to get the ball over the pond that bends around from the front of the green to its left side. I didn’t trust my natural fade. I made sure I came across the ball more than normal. I easily cleared the water, but the ball curved more than I wanted. It landed in the rough well right of the green. I’d short sided myself. Finishing with a string of six pars didn’t look so probable now. But I never say never. It is when the situation is toughest that you mustn’t give up. Just like I needed to find a way to get onto Shinnecock Hills and Pine Valley, I needed to find a way to get the ball to the bottom of the cup in two strokes on this hole. I studied the situation and figured the only way to get it close was a flop shot. It was a high risk shot with the water on the other side of the green. Lob wedges can turn into 2 irons pretty quickly if you don’t get under the ball on the flop shot. I set up with the ball toward the front of my stance, laid the clubface completely open, took a full swing and slid the clubface under the ball. The ball sailed high and toward the pin. It hit with a thud just left of the flag and rolled three feet away, allowing Justen and me to see the line for my par putt. Armed with the knowledge gleaned from watching the ball move past the hole, I struck the ball and rolled it in the cup to save par. My risky flop shot had paid off. My string of pars was intact. The clubhouse and that a cold Coca Cola awaited in the distance just behind the eighteen green. The bunkers off the right side of the dogleg right fairway on this almost four-hundred-yard par four were well beyond the reach of any drive I could hit. A smooth swing and another drive sailed down the middle of the fairway. As Justen and I stood next to the ball, 177 yards from a front middle pin, he did the unthinkable. He said “Mr. James, I don’t think you’ve been in a bunker all day.” Suddenly, all the bunkers around the green looked like moon craters. Now, not only was my head filled with thoughts of finishing with six straight pars, the added thoughts of eluding all the sand on the course were also rushing through my mind. Justen and I had forgotten about the ball that kicked into the bunker on the par three fifth hole. I asked Justen for my one eighty club to try to get the ball close rather than a longer one that could get me safely on the green past the flag. I wanted that closing par. I knew as soon as the ball left the club, that I’d hit it on a line toward the front right bunker. My only hope was that it would move far enough right or stay in the air for a couple of extra yards to miss the bunker. It didn’t. So much for staying out of the sand, not to mention being challenged to save par. I caught the ball thin and hit over the green and into the rough. I pitched on and made the putt to save bogey. It was a disappointing finish to an otherwise satisfying round of 79 and a second consecutive sub eighty score. While waiting for the foursome that invited me to hang around for drinks, I went to the Pro Shop to meet Jeff Kiddie and thank him for allowing me to play the course. Low and behold, Gil Hanse was there. He’d been out walking the course. I chatted with him for a few moments about all those bunkers he’d added to the course and about the renovations he was making at Merion. Joe and Andrew joined me at a table on the patio after they finished their round. We talked about our rounds and my quest. Joe asked if I was set for the remaining courses. I said, “well I’m still struggling to get onto Shinnecock and Pine Valley.” He said, “we have several members that are also members at Pine Valley.” Andrew said, “yeah, you don’t need to worry about that one. I’ll make a couple of calls and take care of it for you.” This was what has made this such a wonderful journey. That common passion for the game of golf instantly makes friends of strangers. Joe and Andrew introduced me to their families and several of the other members as we chatted on the patio. After exchanging contact information, I was on my way to the airport to head to Chicago to play my 92nd and 93rd courses, the Chicago Golf Club and Rich Harvest Farms.